Several months before Thanksgiving, my mom called to ask if we'd be coming to Arkansas. John and I talked about it and decided that since we were there in July, we'd stay in Colorado. My sweet friend, Kathy, invited the Thanksgiving orphans (that would be us) to come eat turkey with them and spend a few days on their ranch, to which I replied, "Absolutely we'd love to come to your beautiful ranch!" And that was our plan until a couple of weeks ago. Then my dad's health stuff popped up and we decided we probably needed to go to his house in Arkansas. But then he decided to come to Colorado. And then his procedure got bumped up and so our trip to Arkansas was back on. And then it was off. SO, we left this morning for a 16-hour trek to Arkansas. We'd been on the road about 4 hours when my dad called to tell me that his surgeon had a cancellation and they could operate next week. John and I talked about it. We talked with my dad some more. And my sister. And we decided to turn around and head back to our house so I could get things in order to fly out next week. How's that for being LIMBER? The kids have a tent set up in the den and are working on a "show" for us. We stopped at the store on the way back into town and bought a turkey and everything we need for a (modified) holiday meal tomorrow. I had made a double batch of cornbread dressing to take to my sister's house, and now I feel (super duper) sorry for her because she has a turkey but no dressing!!! We'll sure enjoy it though! Tomorrow we're going to sleep in, have a yummy breakfast (not IHOP because we ate out so much today), watch the Macy's Thanksgiving Day parade, eat turkey and dressing, play games and just enjoy a lazy day at home. It's supposed to snow 3-4 inches, and we talked about going to Toboggan Hill if the snow piles up. Or maybe take the kids to see Bolt. Or maybe just stay cozied up in the house together. I'm a little sad about not seeing my dad, but I just booked my ticket for his surgery next week, and I'll see him in a few days. My kids will see him at Christmas since we decided on the drive home that we're going to Arkansas then. 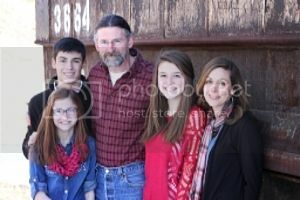 We talked a little about going to the ranch after all, and we had another invite from some other sweet friends once we got home, but we feel like it's important that we spend this holiday as a family of five. Especially if we're going to travel for Christmas. There's no place like home...and for me, there's no place like home with all my peeps gathered around me. I'm going to savor the day tomorrow, and I hope you will too! Happy Thanksgiving!!! What a wild day, Meredith. I'm glad you're able to be there for your Dad next week. I'll keep y'all in my prayers. I hope your Thanksgiving is wonderful. I agree. There's no place like home with friends and family gathered around! Happy Thanksgiving! Wow - good thing you can just go with the flow! That is a lot of see-sawing back and forth. But I am happy you will be able to fly out and be with him next week, and that you weren't TOO far into the trip (but still...4 hours...wow) when you got the call. Enjoy your day tomorrow with your sweet family! Happy Thanksgiving! Limber is looking good on you! :o)I am glad you were able to get tickets to be with your dad next week. Enjoy your special time at home for Thanksgiving with your family tommorrow. Watch the parade for me as we are driving to OK.
Glad that you are going to get to be with your dad next week....hope all goes well. Enjoy your day tomorrow as a family! See, you're more limber than you thought! That was a whirlwind day for sure. Talk about a see saw day but grateful for your Dad being able to have his surgery sooner. "never a dull moment" heh? glad you are having a happy day at home with your family. praying for your dad. our guests who are with us now left their home last Sat. am....got 45 minutes down the road and had car trouble. after a 1 hour wait on AAA tow truck and another long wait on mechanics to figure out what was wrong, they decided to go home and leave the vehicle with their family mechanic. they got their brother's car and left again (it was noon by now). 9 hours later (and 5 hours later than planned), they arrived at our house. life's an adventure...that's for sure! sooooooooooo impressed with your attitude! so inspiring! hope your day is full of blessings, good food, and happy memories! Enjoy your peeps and turkey. Hope you enjoyed your quiet Thanksgiving. Ours has been pretty quiet, too, just us and Mike's mom, who isn't able to talk much anymore. But it's been good. I'll be praying for your dad next week. Wowza. Bending readily; flexible; pliant, did you say? Nothing like on-the-job training, is there? I hope your family-of-five tank gets full to overflowing with rest, love, and peace this weekend to gear you up for the weeks ahead. No more exams! Yay! Haha that was so random. Talk about doing the splits!!! I am so glad that you had the opportunity to celebrate Thanksgiving as a family of five. It's sounds like it was the perfect day! Wow. The Great Thanksgiving Debate of '08, huh?! Well, I hope you had a really great day, even with a 'modified' meal. I just pulled out our leftovers. Yeah...that see-saw made me a little dizzy. I am glad you are home and got your plans all worked out. Keeping you and your dad and your whole family in my prayers. Let me know the day of his surgery ok? There is truly no place like home!!! I am so proud of your flexibility! We really see-sawed this year too. My hopes of cooking my first Thanksgiving dinner were gone, but I got to spend some great family time at my grandparents house. Hope your Thanksgiving was very special! Do you know yet approx dates you'll be traveling in Dec? First treatment was Wed--so far, so good. Praise the Lord!